We assist developers, businesses, schools and other organisations in the development of Green and Residential Travel Plans. 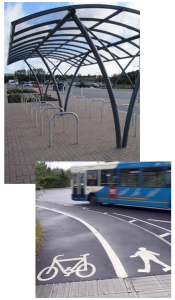 For example, this may be in support of your application for planning permission from the local planning department or highway authority, in order to demonstrate how your proposals contribute to local and national sustainable transport targets. A Green Travel Plan identifies and promotes ways to encourage a range of sustainable transport modes and more environmentally-friendly alternatives to the private car. The alternative options include walking, cycling, using public transport or car sharing. The benefits of sustainable travel include less congestion on the road network, reduced pollution and a healthier population. Green Travel Plans are normally adopted by businesses or other organisations and outline how they intend to adapt travel behaviours in order to promote and achieve the benefits outlined above. Reducing the need for car use with benefits in terms of reduced traffic, congestion, air pollution and accidents. Improving accessibility and travel choice for reaching local facilities. Improving public transport provision for people in nearby developments because of the increased economies of scale. Increasing scope for child-friendly housing layouts with fewer roads, vehicle movements and parking areas. Complementing nearby travel plans, and possibly even assisting them in achieving more ambitious initiatives. 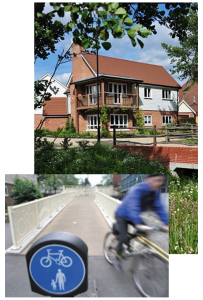 Improving access by the wider community to the residential development by sustainable modes of transport. Representing good practice and providing an educational tool to help change perceptions about the convenience and benefits of not using the car where alternatives exist. Achieving more attractive environments that contribute to regeneration and renewal initiatives.